Yesterday a friend popped over, and she said she didn’t know how we could be bothered with the mess the dogs make…..now admittedly our home wasn’t looking at its best….we had been for a long 2 hour beach walk and our three dogs had brough back generous helpings of sand to attempt to recreate the beach in our front room…however it got me thinking about how differently we all approach mess. In my mind mess usually follows on from having had some fun, having lived a little, and the only way to avoid mess would seem to be not to live much. So we could avoid walking the dogs on the beach, and this would save us the beach reconstructions which inevitably follow….but we all love beach walks, and the dogs make it more fun…always. The other option would be to avoid owning dogs, but I’m afraid that I just can’t imagine such a life, and how much less fun it would be. A third option might be to shave the dogs, but that would just be wrong on so many levels. So tolerating the mess seems the only viable option for me. To be honest I don’t usually give the mess, which tumbles, with as much certainty and regularity as the earth rotates around the sun, from the dogs coats in generous scatterings across the house, much thought. Regular hoovering sorts it out, and it’s just a part of life, like eating and breathing. But my friends comment has me thinking that not everyone is like me….probably safer for the world that way….and that perhaps some people avoid situations and circumstance specifically because of the mess generated. I do know somebody who doesn’t have kids, because of the mess they would make of her beautiful home. This seems so sad to me, as she is missing out on the joy and wonder of opening her life to share its creativity with another, whether that’s a child or a dog…or perhaps just another person….but we are all different and we make different choices. I know somebody else who hates trees, because all they make him think of are the leaves which he will certainly have to sweep up come Autumn. So it seems that some peoples thoughts inevitably turn to the future and to the work of cleaning up which might be generated by objects or events. When I think of throwing a party I’m thinking about the fun and laughter, the drinks and the stories, the food and the memories…..I guess somebody else might think of the mess that will have been generated, and the effort of tidying up. 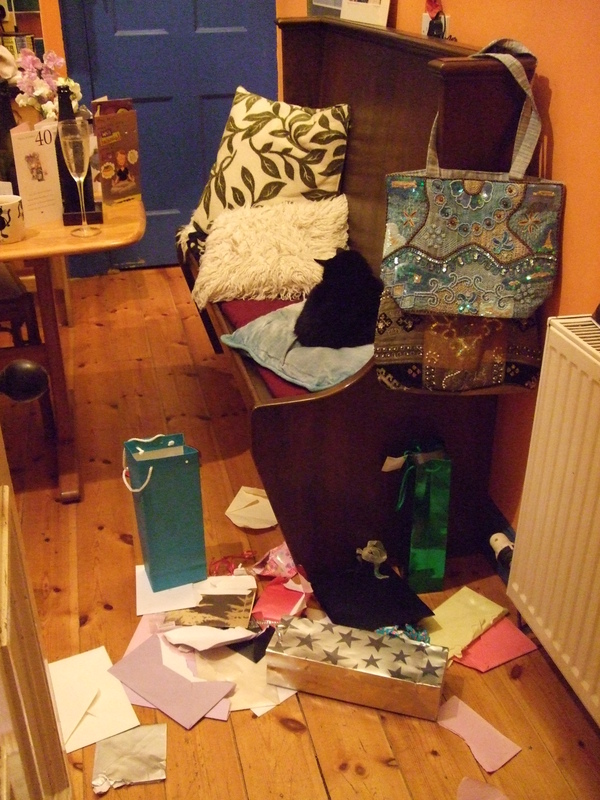 I took this photo after celebrating a rather large birthday in my home a few years ago, and I took it because it made me smile when I came down in the morning and saw the debris of the fun we had all shared the night before….. The surest way to avoid mess would seem to be to live alone, and to avoid change and the experiences which life is just waiting to throw our way. It also feels to me that creativity and mess are intricately linked….to create anything you need to make a mess. Just think of baking and all the flour dust, of painting and all the splattering, of an open fire and all that ash, of gardening and all that mud….but would I give up any of these things because of the mess? No way!! And now that I’ve noticed this I fully intend to embrace and enjoy the messy bits just as much as the (nearly/possibly) perfect outcome. 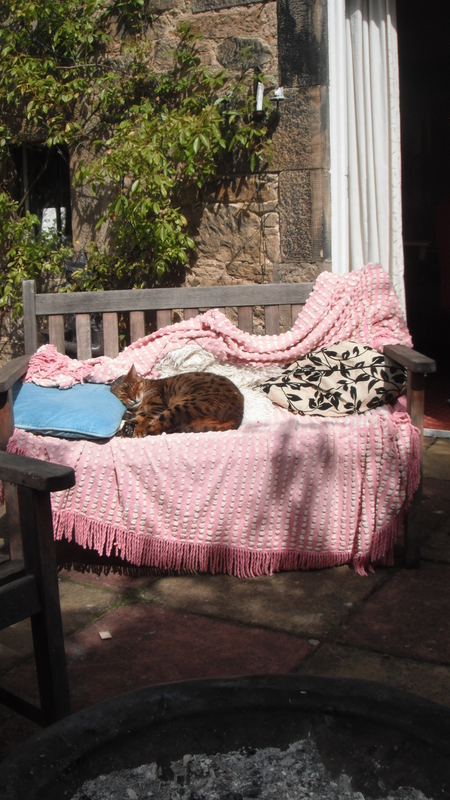 Here’s the leftovers of a more recent nights fun…being enjoyed by our Bengal cat…. 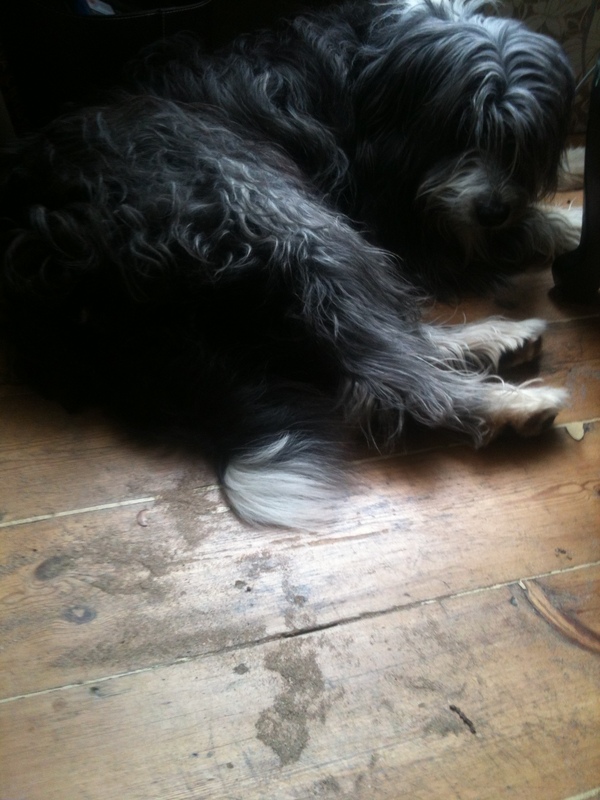 This entry was posted in dogs, mindfulness, photos, poem, thoughts and tagged creativity, dogs, fun, gardening, kids, life, living fully, mess, messy life, mindfulness, parties, photo, poem, poetry, tidy. Bookmark the permalink. I started reading your post and totally agreeing with you, when i got to the picture where your belgan cat is taking a nap on the sofa…. and i forgot all about the mess. I don’t care, i want to take a nap in that sofa too, asap! And i want to take that nap hugging that cat!!!! Great pictures! I find that when you have pets your house is messy no matter what. It’s just one of those things. I have learned to give in to it and to do what I can when I have time to. There are so many better things to do than cleaning.